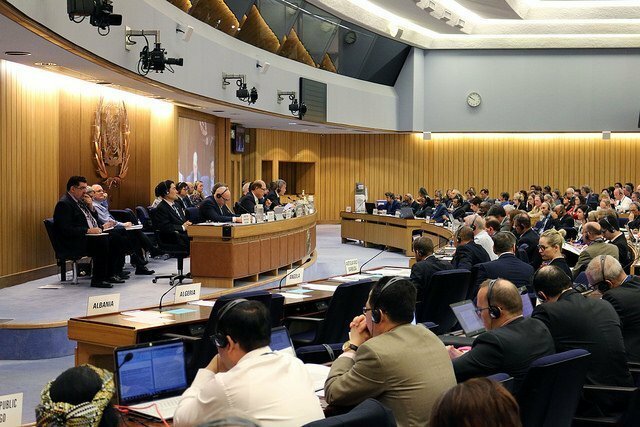 The 73rd meeting of the Marine Environment Protection Committee (MEPC) will take place at the London headquarters of the International Maritime Organization (IMO) next week and pressure is building to deliver some concrete commitments to decarbonise the industry. The gathering will be the first United Nations multilateral meeting to address climate change since the high profile International Panel on Climate Change (IPCC) special report published last week, which highlighted the devastating consequences of failing to achieve the goals of the Paris Agreement, and that global warming of 2°C or more will not be safe for any country. A statement issued from the so-called High Ambition Coalition of countries, led by the Marshall Islands, ahead of the London negotiations, said it was vital the IMO demonstrates that it is taking steps to fully implement its initial strategy, agreed in April, to combat climate change. The statement stressed it was important to prioritise and develop measures that have the potential to achieve further reductions of greenhouse gas emissions before 2023. Dr Morgan Wairiu, one of the lead authors of the landmark IPCC’s 1.5 degrees special report, gave a presentation to IMO earlier this week on the urgent need for shipping to develop decarbonising measures fast. While the IMO in its initial strategy has a goal for shipping to reduce emissions by at least 50% by 2050 compared to 2008 levels, Wairiu, who hails from the climate-endangered Solomon Islands, urged that shipping must go further and meet zero emissions by then. “Energy efficiency measures, market-based measures, and zero carbon fuels all need to be pursued immediately,” Wairiu stressed. Dr Morgan is an outstanding colleague at the University of the South Pacific. I’m proud to know him. USP is owned by 12 Pacific countries, many at the coalface of charting the IMO’s decarbonisation pathway – we’re proud to be providing technical and scientific support to these negotiations and to be training the next generation of Island negotiators to make sure it happens in time. If our small island states and our small university can do it, there can be no excuse for the rest of the world. As Ghandi said – to lead by example is not AN option, it is the ONLY option. Thanks for leading the way Morgan.